​2018 has been one heck of a year for Boston Red Sox right fielder Mookie Betts. Yet somehow he managed to be even more impressive than you may have initially thought. This year, Betts became the second player in Major League Baseball history to win a Gold Glove, Silver Slugger, World Series and ​MVP, after Mike Schmidt of the Philadelphia Phillies achieved the same feat in 1980. Betts won MVP, Gold Glove, Silver Slugger and World Series. Only other major-leaguer to ever do that is Mike Schmidt in 1980. While Schmidt also won the World Series MVP in 1980, I still give Betts the edge in the debate for best season ever. 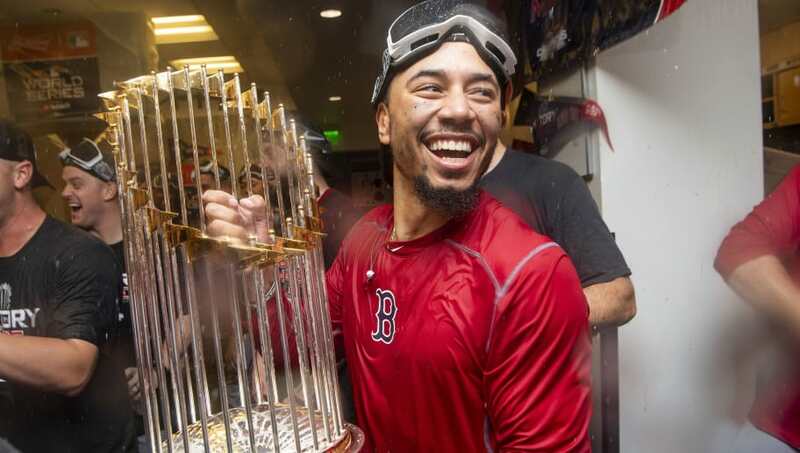 In addition to the four awards mentioned above, Betts also won the American League batting title with a .346 average, and ​celebrated the birth of his newborn daughter with long-time girlfriend Brianna Hammond last week. The five-year veteran also made history this season by posting a WAR of 10.9, tying for 21st on the list of best single-season position player WAR with former Red Sox great Ted Williams' 1946 season. It's also the highest mark since Barry Bonds' 11.8 in 2002. Not to mention the fact that he was a huge part of a team that shattered the Red Sox record for wins in a season with 108! All of these awards and accomplishments would make the average person's head spin, but Betts seems like the kind of guy who's eyes are always locked on what's next, and I'm sure he's looking to make 2019 even better than this year.